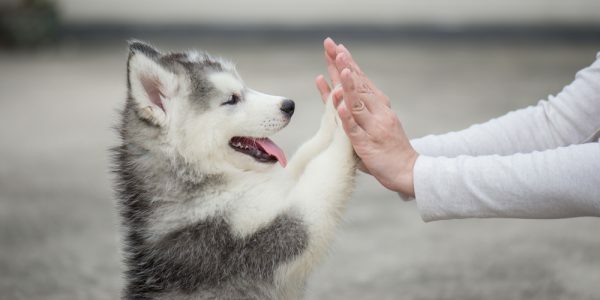 By now, most dog owners are aware that their pet can’t eat chocolate or drink alcohol or caffeine. 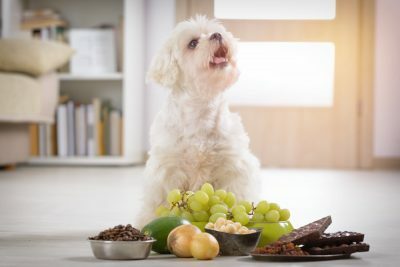 However, there are plenty of other seemingly innocuous natural foods that are often fed as treats to dogs that can cause health issues. In this blog, we take a look at 4 natural foods which can be toxic to dogs and offer some safe alternatives. Whilst a little bit of avocado probably won’t do any harm, too much avocado can cause vomiting and diarrhoea in dogs. This is due to persin, which is a naturally occurring fungicidal toxin present in the seed, skin and flesh of the avocado. Dog friendly alternative: Sweet, creamy and full of vitamins, a little bit of banana as an occasional treat won’t cause any tummy upset. 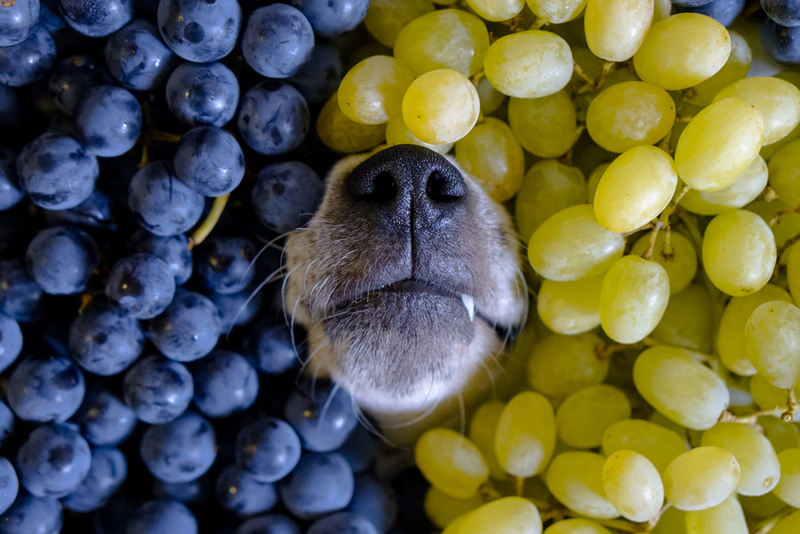 Seemingly the perfect treat sized piece of fruit, grapes are actually toxic to dogs and can cause kidney failure. Early signs of kidney failure to watch out for include repeated vomiting, sluggish behaviour and depression. Dog friendly alternative: Equally compact and full of antioxidants, blueberries make a great replacement treat. Feeding dogs raw meat like they would eat in the wild is fine right? The flaw in this thinking is that the raw meat or eggs you feed to your dog comes from a supermarket and is therefore a potential carrier of disease-causing bacteria such as salmonella or E. coli. Raw fish can also carry parasites which cause vomiting, fever and swollen lymph nodes. Dog friendly alternative: Lean, cooked meat (never cooked bones) is fine as part of a balanced diet. Talk to your vet if you are considering putting your pet on a raw or home cooked diet as it is not suitable for all dogs. It’s not just green potatoes! All parts of the raw potato and the potato plant contain glycoalkaloids called solanine and chaconine. These toxins can cause a range of symptoms in dogs including heart problems, breathing problems, gastrointestinal upset, nervous system tremors and kidney function disorders. Dog friendly alternative: Raw carrots are sweet, tasty, safe and are packed full of vitamins. 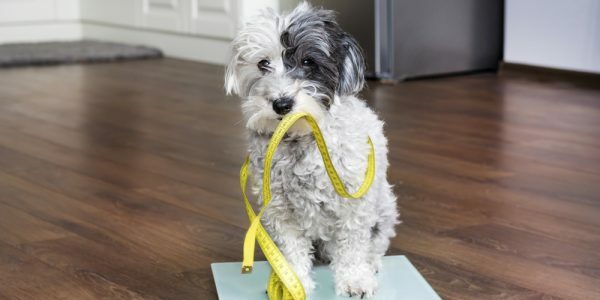 Whilst our suggestion alternatives are all fine for your dog to eat, keep in mind that no more than 10% of your dog’s daily intake should come from treats. 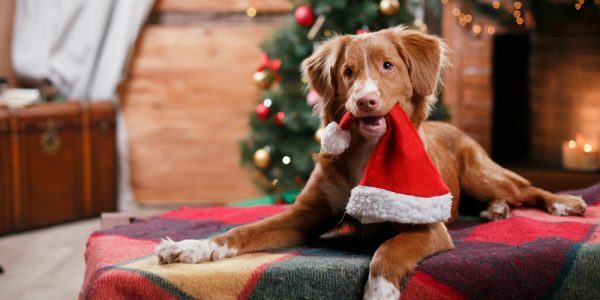 If you find your pet has eaten any of the toxic foods we have listed in this article, call Vets on Parker immediately on (03) 9850 1355 even if they are not displaying any symptoms of illness. Our Templestowe veterinary clinic team will be able to advise you on the best course of action.